Last week, I was in Birmingham for an all-day event with around 500 other small business owners. The afternoon session was led by a very interesting speaker called Casper Berry. As an ex-professional poker player, he did a fantastic and very thought-provoking presentation about risk taking, poker and the links to success in business. For lots of reasons, you need to take risks if you want to be successful. That’s because, risks stretch your comfort zone and open up a realm of new possibilities. What’s more, within the area of “acceptable risk” lies additional profits and benefits that you’ll never gain access to if you stay where you feel safe. In fact, you could say that the greatest risk of all is being so risk averse, you don’t even attempt anything new that lies outside of your comfort zone. And if you do that, what could you be missing out on? Now don’t misunderstand me here. I’m not suggesting that you be reckless. No no, that approach is dangerous. Instead, I’m suggesting that you weigh up all the information available to you, and take a calculated risk based on what you know and what you predict the outcome could be. Or to say it another way, ensure you understand the parameters and ensure you’ve weighed everything up before deciding if it’s the right thing for your business. It’s kind of like doing a skydive. Seriously scary if you’ve never done one before, and all your senses are telling you that it’s totally crazy to jump out of the plane into the unknown. But because you’ve weighed up the risks, the magic of the experience makes the free fall well worth it. And once you’ve done it once, you’ll probably want to do it again – PLUS your perspective of what you thought was possible, shifts forever. For sure, not all the risks you take with your marketing will pay off. There is a chance you’ll misread the market or overlook something that’s important to your customers. In addition, you may get your message, angle or media totally wrong and therefore won’t generate the return that you hoped for. But let’s face it. 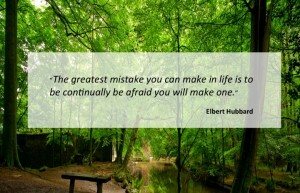 Is a mistake really a mistake if you learn from it? And on the other hand, if you break the mould and do something different from the standard expected in your industry, you’ll stand out. And once you stand out, you have a chance of getting noticed, getting talked about and getting more customers. I reckon if you continue to play it safe with your marketing and stick with what you know, you’re likely to get the same results you’ve experienced to date. And whilst at this moment in time, those results might seem OK, you need to be aware that there will be competitors who will continually innovate. What will you take on? So as this year closes and you start planning your marketing plans for next year, I encourage you to make the decision to do something that stretches you a little. Could you write a 30 day auto responder such as my 30 Days of Copywriting Love to ensure you stay on the radar of potential customers? Whatever it is for you, push past your comfort zone and try something different. BUT, the alternative is that it could be the best thing you do for your business 🙂 How cool is that. And if you get stuck, or if fear holds you back, read this powerful quote by Elbert Hubbard (this one is so good it’s pinned up on my office wall).